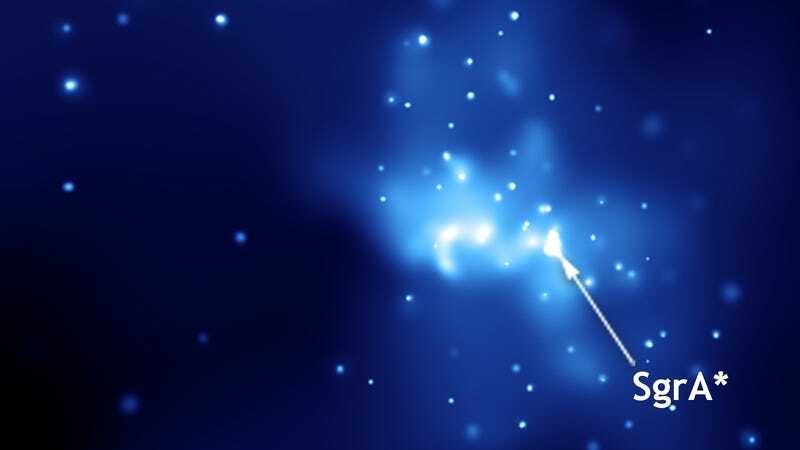 Sagittarius A*, which we’re pretty sure is a black hole. The Event Horizon Telescope, a network of telescopes on mission to observe supermassive black holes at the centers of galaxies, is set to release its first results in a public press conference on Wednesday April 10. We don’t know what the results will be—but they have the potential to be utterly worldview-changing. Black holes are objects so compact and dense that they contain a region in their gravitational field, their event horizon, beyond which space is so warped that light cannot escape. We have tons of evidence that black holes exist, from bursts of radiation emitted from galactic centers to ripples through spacetime called gravitational waves. But we’ve never seen one up close. That’s the goal of the Event Horizon Telescope, which operates under a principle called very long baseline interferometry, or VLBI. The “telescope” is actually a collaboration of telescopes around the world, from the United States to Chile to the South Pole, which all observe the same distant object at the same time. The data is brought together at a central location and then decoded to produce higher-resolution images than would be possible with a single telescope. It’s like turning the entire Earth into one large telescope. The resolution increase is mind boggling. Hopefully, the telescope will be able to resolve the center of the galaxy, a region over 25,000 light-years away that is only about the size of Mercury’s orbit around the Sun. The targets of the telescope’s observing runs thus far have been Sagittarius A*, a radio wave-emitting region of our galaxy that looks a whole lot like a supermassive black hole with a mass 4 million times that of the Sun, as well as the center of the galaxy M87, where there is presumably another supermassive black hole, this one around 7 billion times the mass of the Sun and spewing a high-energy jet of matter. This week, the National Science Foundation announced that it and the EHT collaboration would hold a press conference in Washington D.C., with simultaneous press conferences in Brussels, Santiago, Shanghai, Taipei, and Tokyo, to announce “a groundbreaking result.” Unfortunately, we don’t know what this result will be—and I’d otherwise prefer not to feed into the hype—but if the result is what we hope it is, it will be incredible, possibly showing the shadow that the black hole creates against the backdrop of the cosmos. It would become one of the most important images in scientific history. A simulation of a black hole observed by the EHT. But we don’t know what it’s going to show, yet. If it shows something different from astronomers’ expectations, that would be exciting too. Whatever the result, scientists are excited for all of the questions and potential lines of research that will come out of the data release. I’m trying to treat this all with cautious optimism, since, again, we don’t know what kind of images we’ll see next week. But when scientists call big, internationally broadcast press conferences like this, it’s usually because they have a big result. The press conference will begin on April 10 at 9 a.m. EDT, and we’ll definitely be covering it here on Gizmodo.